Backup power supplies constitute a very important component of an alarm system as they enable its uninterrupted operation even in cases when the main power supply is faulty for several hours. In the event of the main power loss, a backup power supply provides energy from a connected battery, typically a non-spillable lead-acid battery being a perfect solution for backup power supply applications. Supply voltage is one of the basic parameters of power supplies. For the purposes of intrusion detection systems, typical supply voltage is 12 V DC. This voltage is applied in most devices. In certain special applications, 24 V DC supply voltage is also provided. Another important parameter of a power supply is its current efficiency as it defines its ability to supply a required amount of power. As far as backup power supplies are concerned, the total current efficiency includes current supplied to external devices operated by a power supply and current used to charge an embedded battery. While selecting a power supply you must remember that its total efficiency minus battery charging current must not be lower than the total current draw of the devices to be supplied. Another important backup power supply parameter is battery charging current. 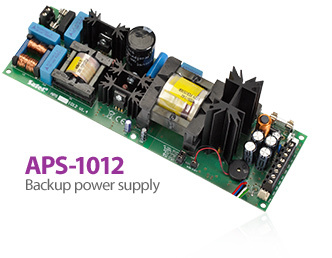 Backup power supplies are equipped with charging systems with a current limitation which protect a connected battery against damage and correctly distribute power supply current efficiency into battery charging current and current supplied to external devices. The charging current value influences the time necessary to fully recharge a battery or, looking from the other side, the maximum capacity of a battery which can be recharged within given time. 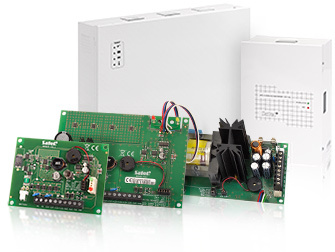 Several different designs are employed for backup power supplies used in alarm systems. The simplest power supplies with line stabilisers have relatively low efficiency as an amount of energy necessary to correctly stabilise the output voltage is irretrievably lost in the form of heat. Apart from low efficiency, this solution may have a short life cycle in unfavourable conditions due to the amount of heat generated. Power supplies with impulse stabilisation operating with input voltage decreased by means of a network transformer are a better solution. 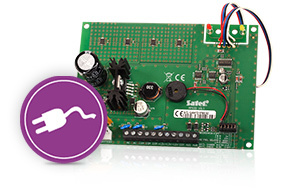 This design ensures decent efficiency and is a perfect solution for typical alarm applications. The highest efficiency is obtained by switched power supplies with direct line voltage processing. Thanks to using high-performance elements, such power supplies are the best solution for applications subject to high loads which would cause much higher energy losses in traditionally designed devices. Regardless of the design, each backup power supply operating alarm installation elements must be equipped with certain filters and protection devices. Filters are to guarantee relatively "clean" power supply for devices, i.e. free from interferences which may have negative impact on operation of critical installation elements. The role of protection devices is to minimise the risk of damaging a power supply in case an installation is incorrectly connected or damaged during its operation. 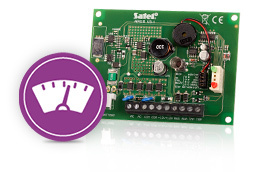 SATEL's offer includes a number of high-performance 12 V switched power supplies ensuring efficiency from 1.5 A even up to 10 A. 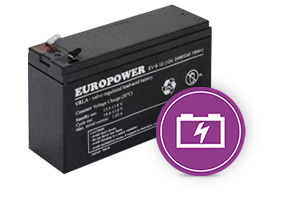 Apart from 12 V power supplies, a 24 V model is also available for less typical installations.